Oculus Rift is a good VR headset, but it'd be even better if you could bring your hands into the action. Oh, wait, you can. Well, you will be able to, soon, and now we know just how much that will cost you. 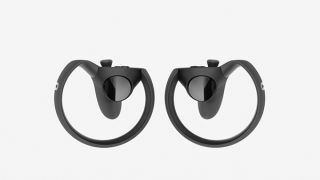 See, Oculus has yet to ship the Touch controllers that allow users to interact with the Rift using more than just their eyeballs and a tethered Xbox One controller. The Touch should launch sometime in the next few months, and a keen observer has spotted the controllers' price on display at a GAME store in the UK. That's £190 for the pair plus an additional camera system for improved tracking, notes TechCrunch, though you'll need to make a £50 deposit to secure your pre-order at this store. Road to VR was able to confirm that this retailer is taking Touch pre-orders now, and was told by an in-store Oculus rep to look for a "winter release." A straight conversion brings the US Touch controller price to around $250, and the Australian bill to AU$325. We'd expect the US cost to be closer to $200, and the Australian price to be a bit more reasonable as well. Still, it's clear the Touch controllers likely won't come cheap. For comparison, the 500GB Xbox One S and PS4 Slim are priced at £249/$299/AU$399 and £259/$299/AU$600, respectively. You're essentially almost paying for the price of a console when you buy the Oculus Touch controllers. Yikes. That's on top of the £499/$600/AU$649 you're already paying for the Oculus Rift headset, sans controllers, as well as the PC system needed to run the entire experience. All that tallied together makes the Oculus Rift plus controllers a very pricey proposition. Somewhat sweetening the pot are all the Touch-enabled games you can fully immerse yourself in once the controllers become available. There will be a number of new titles ready to roll as soon as Touch goes on sale, and more should quickly follow. It's likely Oculus will announce a reasonably priced bundle for the Oculus Rift and Touch controllers, but that doesn't do much to help those who already own a headset. They've been waiting months for the controllers, and paying a couple hundred pounds/dollars for a pair might not go down well. The third Oculus Connect developer conference kicks off October 5, and it's here we expect more details on the Touch controllers, including official pricing and a set release date. We'll be on the ground at OC3, as it's being called, and will bring you the latest on Touch, Rift, and all things Oculus.